These tablets are perfect for conferences where they can be handed out to attendees fully pre-loaded with conference material. 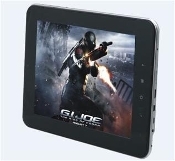 Pre-load these tablets with educational material, product information, company information and more. Conference attendees will no longer have to carry catalogs, brochures and other material through the conference. Instead these nice tablets are the only devices they will need to carry with them and keep them updated of latest events at the conference.